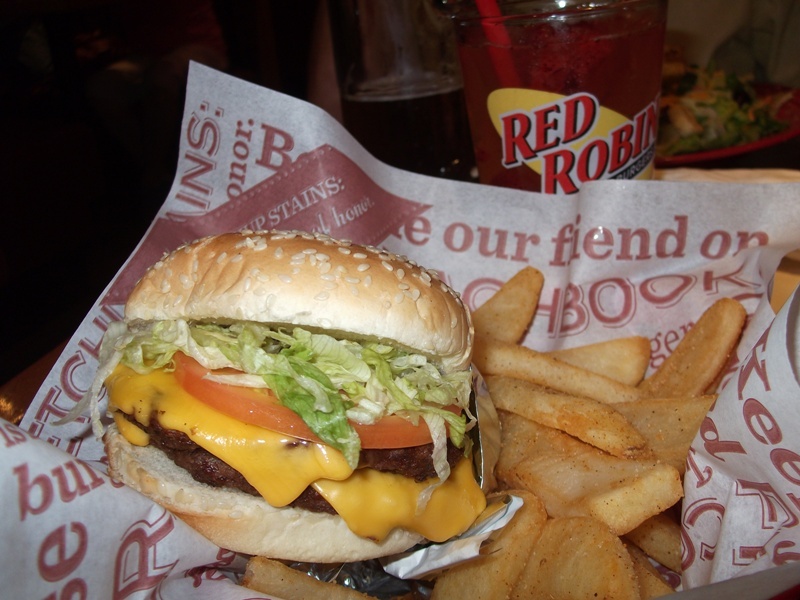 Mom & Dad took me to Red Robin so that I could try December’s Burger of the Month. The ‘Smoke and Pepper Signature Burger’ is a regular Red Robin burger patty seasoned with “smoked sea salt” (I have no idea what that is) and topped with peppered bacon and cheddar cheese on a toasted ciabatta bun. The bun is spread with “house-made smoke & pepper ketchup” and there is a side of the fancy ketchup with the french fries. The ciabatta bun was a bit more chewy than an ordinary burger bun. The bacon and the cheddar cheese were both OK, but I have had peppered bacon and cheddar cheese before so it wasn’t a big deal. The only really new thing was the fancy ketchup. It was OK, but I didn’t think it was that smokey and I think it would have been nicer with a little BBQ flavor. My overall Burger of the Month experience was OK, but Red Robin have made better burgers than this. It just wasn’t really that original. I can only award it a score of 5 out of 10 because of that. Mom had a salad. Seriously, Mom! A salad? At a burger restaurant? Dad had a Bleu Ribon (blue cheese and chipotle sauce) burger. I think he was the happiest person there, but probably because Mom didn’t make him eat a salad too. Back to Red Robin for Red’s Tavern Double! My grandparents took me to Red Robin for lunch. It’s always good to have people who will buy you burgers. If you do not have people who will buy you burgers then I recommend you find some immediately. Granddad ordered a low calorie salad (he’s as boring as Dad!) and Nana ordered a veggie burger (what is happening to this country! ), but I ordered Red’s Tavern Double which has 2 burger patties, 2 slices of American cheese, lettuce, tomato and Red’s Secret Tavern Sauce. I award this burger 7 out of 10. 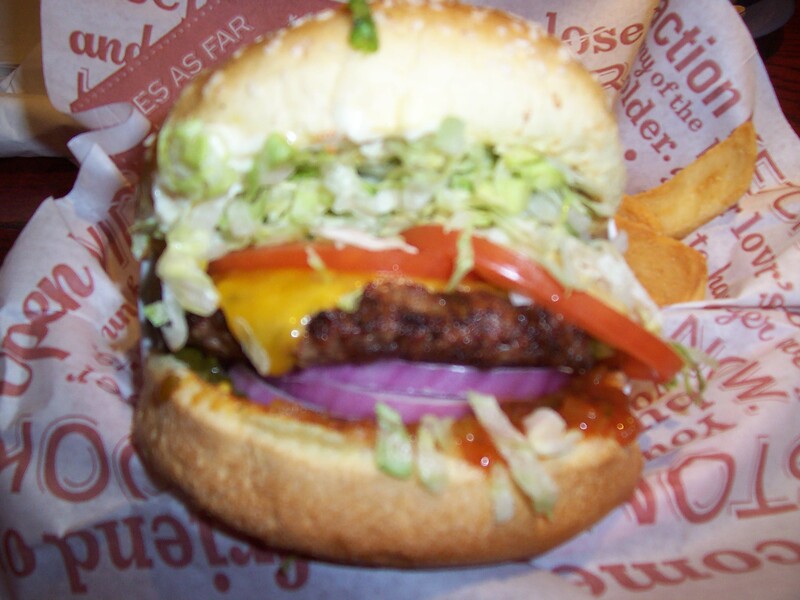 All I have to do now is decide what to order the next time I visit Red Robin! Hey Dad! Those onions make your breath smell funky! While we were at Red Robin (Yum!) Dad ordered a Red Robin Gourmet Cheeseburger with all the toppings. He made me promise not to tell Mum that he was making a bad diet choice, but when she reads this blog she will find out anyway. Busted! Dad ordered his burger “medium” and he said it was really juicy. He definitely had pickles, onions and Red Robin relish because his breath smelled really bad for the next 4 hours. I am surprised Mum didn’t notice that when we got home. Maybe she decided to ignore it. Who knows with parents? Dad says he really likes the Red Robin relish and he thinks that I should try it next time. Thanks, Dad, but probably not. I like my burgers pure! Dad says he gives the Gourmet Cheeseburger a “good to average” 6 out of 10. Visited Red Robin today with Dad. I ordered the “Keep It Simple” Burger (price $7.99, includes “bottomless” fries). The burger came in a warm, soft sesame seed bun. You can customize the burger with a whole grain bun, ciabatta roll or a jalapeño bun. But I prefer the original. Red Robin uses fresh, never frozen patties. Mine was a perfect “well done” and not cooked like old leather. There was still plenty of juice inside and it was not over seasoned. Listed in the menu, the Keep It Simple Burger comes with lettuce, tomato, pickles and onions. I skipped the pickles and onions because I didn’t want my breath to stink! Other options include cheese (cheddar, American, blah blah blah…), Red Robin’s own-brand relish, and a fried egg. No offence to breakfast lovers, but who puts a fried egg on their burger? It’s not normal! Overall I would award this burger 6 out of 10. 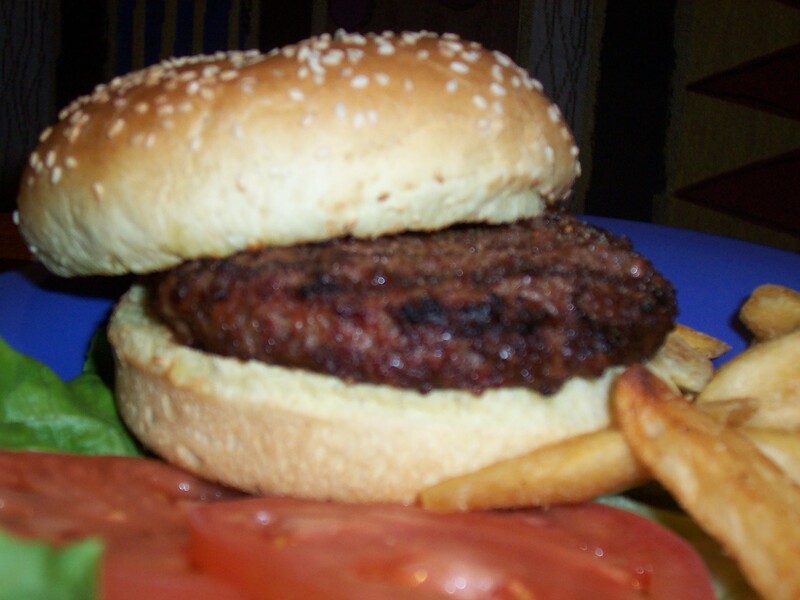 It is perfect for an adult who does not want a huge burger and it is perfect for a kid who does not want to order from the embarrassing kiddie menu.